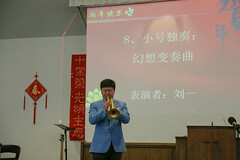 祷告会 Prayer Meeting 上午 9:45-10:00 a.m.
中文堂 Chinese Service 上午 10:00-11:15 a.m.
中文主日學 Chinese SS Class 上午 11:30 a.m.-12:15 p.m.
英文堂 English Service 上午 11:30 a.m.–12:15 p.m.
午餐 Lunch 中午 12:30 p.m.
晨禱會 (Morning Prayer Meeting) 禮拜二, Tuesday 9:00 – 9:45 a.m.
晚祷会 (Evening Prayer Meeting) 禮拜三, Wednesday 7:30－9:00 p.m.
Pastor Wei, I lived a few houses down the street from thou on Yellowstone Dr. I’m now living in Greece and have an international student age 16, staying with us for this coming school year who is from Beijing, China. My family is attending First Bible Baptist Church. 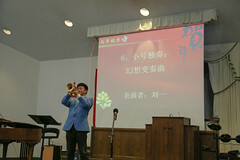 His English is not very good and has been coming to church with us but I know jeez not understanding what’s being discussed in teen class or in the preaching. My thoughts turned to you and possibly bringing him to your service sometime… But maybe bringing him to meet you first. Are you still living on Yellowstone Dr? Do you have any suggestions? I’ve forward your comments to the pastor.